Searching through the Ferguson Collection in Glasgow has been interesting, and turned up a variety of manuscripts related to my interests. Okay, some are in Italian, or are illegible, but still they are worth a look, and others, like the version of Norton’s Ordinal, have nice pictures. One especially useful is a 15th century one that has many alchemical recipes written in English. Thus I can understand them quite well. It is MS 205, and the catalogue says it is a liber de consideratione quinte esentie ervici rerum transmutabili in latin, Xvth century, but it is so much more than that. There is some Lull of course, Albertus and Dekyngstone, the latter which proves it is of English origin. There are also marginal notes, not always of any use but interesting to see what a later reader was interested in. I shall endeavour to get a copy of her thesis. It would save a lot of work, and the wear and tear from me reading the original copy enough times to actually understand it. Meanwhile, I am still learning to read the handwriting, although I am much better at it than I was 8 years ago when I first started looking at original manuscripts. The spelling doesn’t help too. Alchemical texts written and copied in 15th century England – how many survive? A simple question, with a full answer beyond the scope of a mere blog post. Nevertheless I find the question interesting as a way of roughly gauging the popularity of alchemy in that period and the activities of the alchemists. The century was certainly one in which it became more widely known and translation from Latin to English got going. By at least knowing how many MS have survived, we know that more have been destroyed or lost in the meantime, and therefore can make vague estimates of the production of them. Moreover if some expert were to examine them all and compare the handwriting we could tell how many people were copying manuscripts, either for their own use or for whoever was paying them. That and what I have read about manuscripts suggests that they were copied and circulated privately. So unless you could afford a scribe, or were concerned with secrecy, you would do the work yourself. Which naturally limits the copies you could personally make, and does raise questions about how much the works were passed around. The difficulty in estimating numbers of surviving MS is of course how many places have MS. To start with, there is the British Library. Then there are the various university libraries, with Cambridge and Glasgow having good collections. Not to mention libraries abroad as well. All of which makes this a very partial summary. The prose text “Lead”, found on page 313, starts with the simple manufacture of lead acetate, and the distillation thereof, which produces the usual red liquid that is a weird mixture of organic substances. This is no different from the Ripley method suggested by Jennifer Rampling, and I think also that which is produced from John of Rupescissa’s quintessence of alchemy recipe. It even says to put the stilled liquid upon the stuff left behind in the alembick, which Ripley recommends, but then you put it onto silver and make it brittle. At this point I start to wonder if it really means lead, and doesn’t mean some other thing. The description of thin plates, vinegar and the resulting white powder is clearly of lead acetate though, I’ve not heard or seen anything else give such a result. More specifically, the instructions say to put the distilled liquid back onto the white product of calcination of the stuff left after the distillation. Why it would be white is unclear to me, since if it is lead it should be blackish after calcination. So perhaps something unusual is happening here. Or of course the poem is not meant to be taken practically. The Thomas Hend text on page 317 is also clearly a lead and vinegar one. It has suddenly become clear to me how variations in the concept were all the rage in late 15th/ early 16th century England. You see this a lot in alchemical recipes, new fashions in activity and substance that sweep across Europe or countries and hold sway for decades, until something else comes along. That vinegar had been used in earlier recipes is not in doubt, but what happened in the later 15th and early 16th centuries was the codification and spread of specific series of actions which we could dub Ripleyan. These recipes continue to turn up in alchemical literature into the 17th century, in the works of Basil Valentine, as explored by Lawrence Principe. I define them specifically as ones that on the surface use vinegar and have metals, oxide or carbonate, dissolved in the vinegar. It is then distilled, and a red liquid produced. You can get a reddish liquid from such a process, as I have proved myself (https://distillatio.wordpress.com/2013/11/19/382/) and as modern esotericists have also shown. The only slight problem is that things start to diverge from what you would expect given modern chemistry and it all gets a bit complicated and the best thing to do is stop and do something else for a while. Or do more experiments and read more sources, both of which I am planning on doing this year. so I am attempting to summarise some of my thoughts about it now. Concentrating on Europe, and England, the earliest transmission was by learned men travelling to Spain and Sicily, to translate or copy alchemical and other related works on things like astrology and natural philosophy. They then returned home with a copy or two, or the copies were given as gifts to places of learning, or they went home and mentioned alchemy and such in their writings at home. The latter occurred with information about the four elements, as the translator Daniel Morley, who had copied and translated works abroad, being asked to write about this knowledge when he returned home to England in the 12/13th century. The books in places of learning were then copied by other visiting monks/ copied and given as gifts/ read by visitors who made their own notes, and thus the information filtered northwards. Naturally this meant a very slow rate of transmission. It wasn’t until the 13th century and Roger Bacon before we really have much talk about Alchemy in England, but even then there’s not really much evidence of anything until the 1310’s and 1320’s, when it started to get rather busy and crops up in various circumstances, from legal records to an archaeological find in Cambridge. 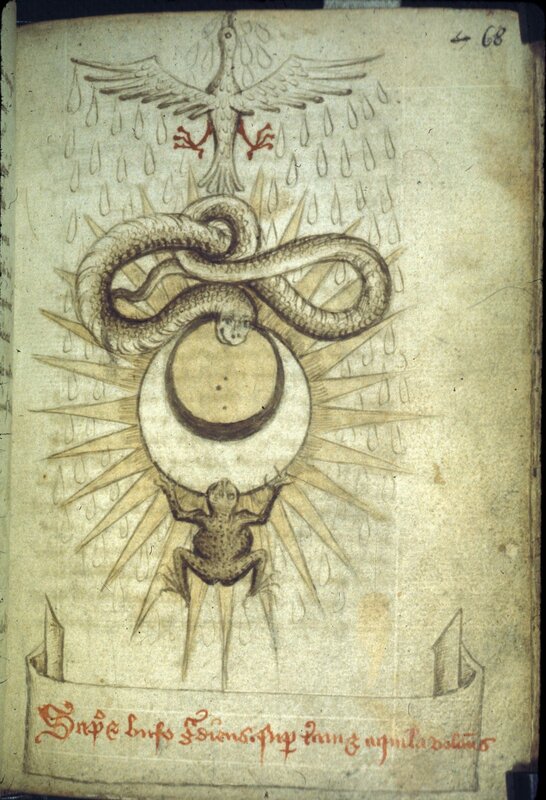 an alchemical work attributed to ar-Razi, called the Lumen Luminum, another false work attributed to Avicenna called the Liber de Anima, as well as of course the Secreta Secretorum of pseudo-Aristotle. The 1330’s were also an interesting time with regards to other alchemical authors with the writing of The Testamentum of Raymond Lull, a pseudo-Lullian treatise, an early version of which claims to have been written in St Katherine’s, London, England in 1332. Unfortunately this was written in Catalan, so whilst the work itself may have been written at the time and place claimed, it didn’t have any effect on English alchemy, and the earliest mention of Lull as an alchemist is apparently from the 2nd half of the 14th century, according to Michela Pereira. Moreover he didn’t really appear in English alchemy until the 15th century, when we find a translation from Catalan into Latin or English taking place. So here we have a possible occurrence of a roundabout route of works, hampered by the use of a minority language (Catalan), and the importance of a universal language, i.e. Latin. Later on, you can see that the audience for alchemical works and numbers of alchemists that we have record of greatly increases as the texts are translated into the local language in the 15th century and more people can read and write. The Semita Recta was translated into English, French and German from Latin in the 15th century, and many of these copies have survived. People passed it around interested parties who then made their own copy or had one made for them. There is evidence for a circle of alchemically interested intellectuals and doctors in 1440’s England, related to the Semita Recta and various pseudo-Albert of Magnus works. They would likely meet and discuss alchemical matters when possible, and pass on manuscripts or copies of them to each other. I see no reason to doubt that similar things were happening all across Europe, with educated men, both professional and mere servants and artisans, learning about alchemy from each other and what works they found. George Ripley, the famous 15th century English Alchemist, allegedly travelled abroad in order to learn more about alchemy and other topics, and by the 16th century we have various learned men writing about collecting books from the continent themselves, or their friends are asked to pick up what books they can find. Of course this was also the age of printing, and of a wider community of letters that was different from the earlier one in the 13th century. Jennifer Rampling has written a paper (Available here: https://www.academia.edu/4760830/Transmission_and_Transmutation_George_Ripley_and_the_Place_of_English_Alchemy_in_Early_Modern_Europe) about how John Dee and Edward Kelly, in their peregrinations about Bohemia and Eastern Europe, spread knowledge of the works of George Ripley, which in turn were used by the alchemists in the late 16th/ early 17th century in their own writings and were also printed in books. However that clearly was not all that happened, although we have several claims about it taking place from the 15th and 16th centuries in England. But perhaps because it was seen as a Donum Dei, a gift of God, the alchemist could learn from books (After all, the Bible was a book too) and ultimately it was God that would give him the knowledge to make the stone. Also the idea was abroad in the later medieval period that it was legitimate to interrogate God’s creation to find out better how it worked, and as such, learning how do transmutation from books and by experimentation was entirely okay. What I do wonder about is how useful alchemy was as a marker for being well educated, which could open some doors for your career, and also as a means of rubbing along well with people of other nationalities. There was to some extent still a pan-European feudal society, with people of the appropriate status mingling easily with each other and having languages and habits in common. Of course by the 16th century that had fragmented with the rise of nationalism and the reformation. I suspect though that it proves more useful in that regard in the 17th century, with the appearance of Rosicrucianism. Certainly religion was important; it turns out that an Irish humanist called Richard Stanihurst (1547-1618) graduated from Oxford, and began alchemical studies in London, but he was a Catholic and left England, working in the Bishopric of Liege, where he was involved in the Paracelsian movement, and he ended up at the court of King Philip II of Spain. I doubt he would have been permitted to attempt to cure various diseases using alchemical methods if he was a Protestant and probably would not have left London. What seems clear from the summary of his life in the summary of Azogue no. 4, is the importance of groups of alchemists/ chymists/ medical men for passing knowledge and practises and supporting research. Stanihurst would surely have had a much harder time of it without support from the likes of the Bishop of Liege and others in the same area. As with the dissemination of Ripleyian alchemy, patronage is an essential part of the travels made by knowledgeable people and dissemination of their works. Unfortunately the issue is that the evidence for earlier ones, such as in the 13th century, just has not survived. So, to summarise it – alchemical knowledge travelled with people as they travelled, and by written texts as they were traded and given and received. It was retarded by language problems, and by distance, and made easier by patronage from the rich and powerful. This is a short blog post covering an interesting but rather deep topic which would require a great deal more research to make a full on really interesting post. So instead you have to make do with this. Maybe in a few years I’ll write something more. Right from the start, alchemy was related to other areas of endeavour or crafts. The recipes in the Physika et Mystika are similar to and sometimes the same as those found in the manuscripts recording various craft recipes, the Leyden and Stockholm papyri. Basically the early alchemists took ideas from Hermetic and gnostic religion and mixed them with physical workshop practises. It seems clear to me that early alchemy was actually a form of philosophy and mysticism and religion; I use all of those words because although an expert could probably make specific distinctions, it is beyond me in the case of the Physika et Mystika and many of the other texts written by Cleopatra or that refer to Isis. 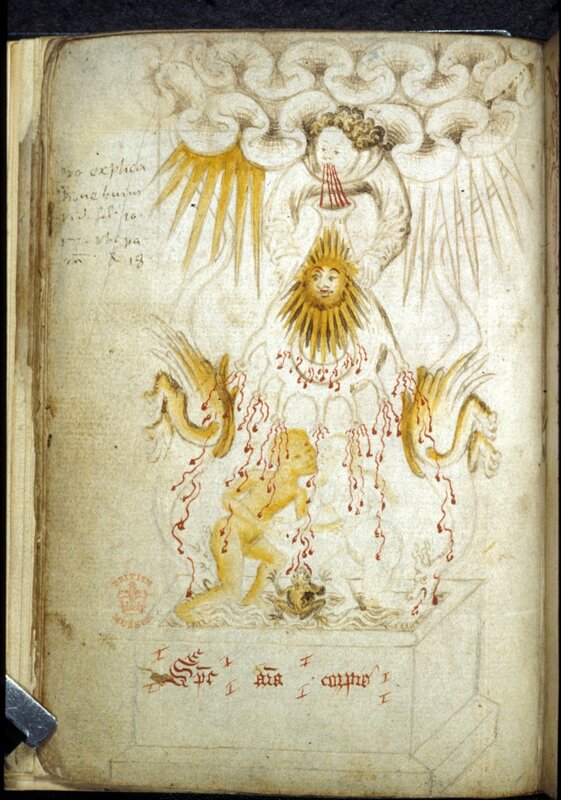 How widespread were alchemical books in Britain in Medieval times and who owned them? Following on from the previous post, it turns out that Henry of Kirkestede mentions 674 authors, but I cannot find any others related to alchemy. Maybe Henry didn’t count alchemical books? Certainly there are a lot of scholarly works in his catalogue, including Thomas Aquinas, Robert Grosseteste and many others less well known. But it is interesting that he mentions Hermes but not alchemy, which was certainly known about in the country in his time; Robert Bacon knew about it, and from the little he knew it seems that knowledge about alchemy was newly arrived in England in his time, a century before Henry. 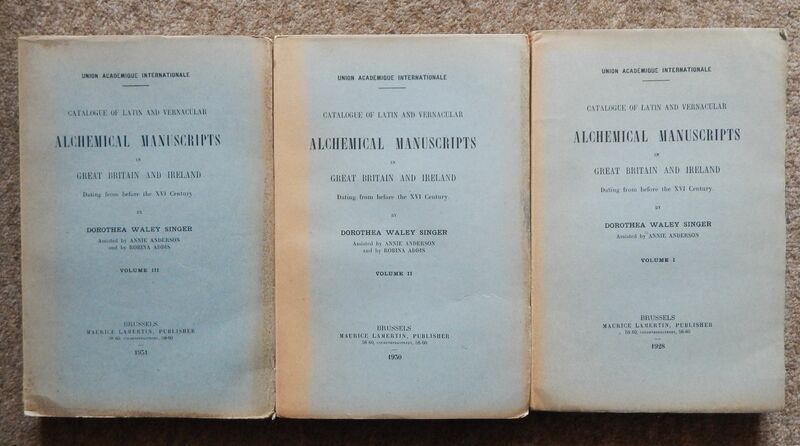 Which leads nicely onto the next question, how widespread were alchemical books? Firstly though a few caveats are in order. Most of the catalogues cover religious institutions, or secular ones with a specific purpose (e.g. almshouses) and so their book choice is likely to be somewhat restricted, and likely would not include many on alchemy. Especially because an interest in it and practise of had been specifically banned in most orders of monks and friars since the late 13th century! An exception would likely be university college libraries, which given the subjects taught and debated, might well contain more alchemically related works than otherwise expected, on the basis that they were part of natural philosophy. So if it turns out as I expect and recall reading in various academic papers, then the locus of alchemical investigation was circles and groups of private individuals. Now, regarding smaller secular institutions, we have volume 14, Hospitals, towns and the Professions. A search of the index finds mention of Bartholomew the Englishman and his De proprietatibus Rerum. Also of an astrological work being written in the same village as an alsmhouse. Index V mentions bestiaria, a couple of editions of the Secreta Secretorum and a copy of the Seneschaucie, but they are anonymous works. One of the Secreta is in the London Hospital of St Mary Elsing in the 7th October 1448 index of books. Another in the 1489 bequest to the Hospital of St Giles in Norwich. The index of authors has no Albertus Magnus, one volume about medicine by Avicenna, no mention of Hermes, one of Robert Grosseteste as translator of Aristotle’s Ethics. Other works cover legal matters, historical ones (e.g. the Scalacronica) and of course theological or religious matters. So the more secular institutions really don’t seem to have had a great interest in Natural History. Now, volume 12, on Scottish Libraries, which covers both royal ones and religious houses and the Universities. Searching the index, no mention of alchemy. The index of authors at least has Albertus Magnus, mainly his commentaries on various authors and his summa theologiae; a full selection of Aristotle, Agustine, Averroes, Bartholomew Anglicus, Bocaccio, Cicero (In Queen Mary’s library at Holyroodhouse) in 1569. Or see works by Galen in St Mary’s college, St Andrews, circa 1574. There is one mention of Hermes, but it is the Poemander translated by Marsilius Ficinus, in Queen Mary’s library. Finally, found Khalid ibn Yazid, Liber Secretorum Alchemiae, in a 1531 printed edition of alchemical works, which contains the speculum alchemiae, and Geber de alchemia. Printed at Strasbourg? It is in St Leonards college in St Andrews, the list made in 1597 or 99. The interesting and clear point is that by the later 16th century there were lots of books, thanks to printing. The list for this college reaches 262 books, many more than in Cathedrals and suchlike two centuries earlier. Ultimately thought it is a bit disappointing. However given the upheavals in Scotland in the early and mid-16th centuries, I think it likely that a fair number of books were lost, destroyed or sold, and thus we do not have a proper accounting of the books present in medieval Scotland. Having said that, there really isn’t any evidence for alchemy in Scotland before James IV and his alchemist in 1501 or 03 or whenever. Now, onto volume 10, the University and College libraries of Cambridge, which should be much more interesting. 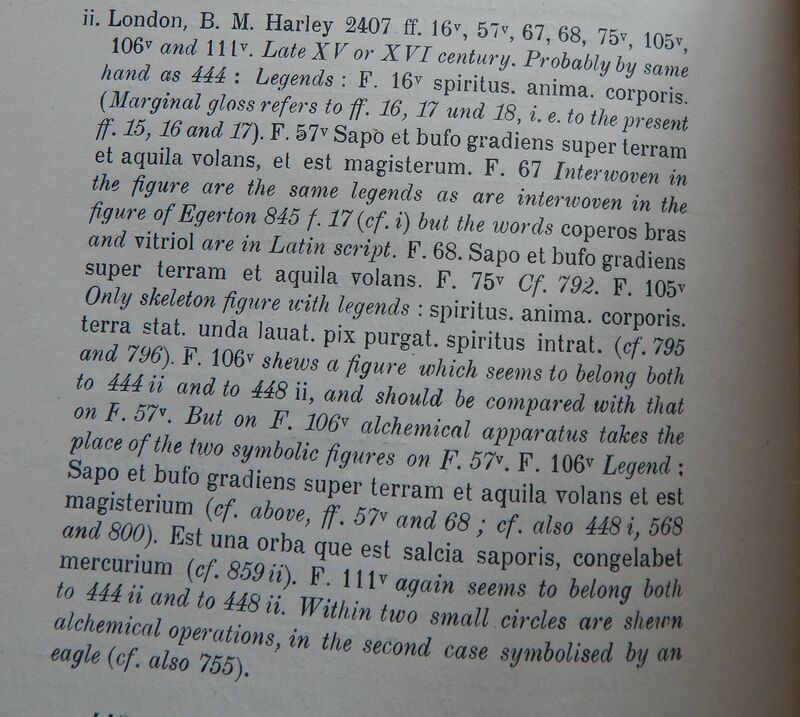 Starting again with the index of authors, we immediately find many copies of Albertus Magnus, including the Mineralia. Also works by Alhazen, Al-Kindi, Alphidius on De lapide Philosophorum, which is found in a 1418 catalogue of Peterhouse college, as part of the Magnus liber Alkymye! Which contains works by Geber, pseudo-Michael Scott, secretum secretorum, speculum alchimiae, Democritus Secretum super corpus, spiritum et animam, and so on. Pseudo-Avicenna’s De Anima comes up at least once. Lots of stuff related to normal natural philosphy, eg Aristotle, Gilbertus etc etc. Hermes, several works, eg Aqua uitae perhennis, and others, in the Peterhouse volume already mentioned. A dialogus de nat ura deorum of Hermes Trismegistus, is in the university common library in 1473. Also contains De spiritu et anima, (Bloomfield 935) whatever that is. A de Quinta essentia of Ioannes de Rvpescissa, in a 1457 King’s college inventory of the library. Michael Scott, Physiognomia siue De secretis naturae, a 1477 edition donated in 1539 to Jesus college. There are quite a few books attributed to Rhazi, not all surely alchemical, but there’s a Flores Secretorum, in the Peterhouse MS, and various others. Also medical works by Richard the Englishman. Lots of books by Grosseteste and Bacon, Thomas Aquinas and the usual texts one would expect in a university related to the Trivium and Quadrivium. So, in summary, there do seem to be more alchemical books in university colleges, but not as many as you might have thought; one volume in particular had a large number of shorter treatises within it. I think it likely that this is partly down to lack of official approval; alchemy is well known for not managing to make the leap to respectability, but there should also be considered the many injunctions to secrecy made by alchemists over the years, that would not permit making the books publicly available. Yet one or two such books were donated to the colleges over the years by former students. It therefore instructive to look at a non-university alchemist. Thomas Norton is famous for his Ordinal of Alchemy, in which he mentions many authors. It was written in the 1470’s, based on the previous 20 years of his alchemical experience. Thus it is later than Kirkstede, and some of the university catalogues. It seems to me, on the evidence available, that there was a flourishing of alchemical knowledge in England in the 1440’s and 50’s, and as such Norton would have more texts available for study. So, alchemists and philosophers he mentions include Albertus Magnus, Arnalde of Villanova, Robert Bacon, Arisleus, Avicenna, Democritus, Dalton, Gilbert Kimere, Hermes, Kalide, Maria, Ortolane, Plato, Raymond Lull, John of Rupescissa, Geber. Which indicates that he had at least heard of, or was familiar with the most famous and popular alchemical authors of the time. In turn that argues that he had or had read a fair number of alchemical manuscripts. Yet only one volume in the list in Cambridge had many of the works by these authors, and some of them didn’t appear at all. I would like to think that a generation or two of Cambridge scholars copied out parts or all of the Magnus liber Alkymye and spread it about the country, but of course proving that would be rather hard. Certainly it seems that a non-academic had access to a great many texts (If of course they could afford to buy them or made the right friends), and there is some confirmation of this if you look at the history of the Libellus de Alchimia or the Semita Recta and the career of Gilbert Kymer and others of his generation in mid-15th century England. These texts and their English copies of them indicate the presence of networks of alchemists and philosophers outwith universities and other seats of learning. Although some of the members held positions within such institutions, the actual alchemical work and manuscripts appears to have been held separate from the official libraries. Certainly I could refine things by looking at the other volumes of the Corpus of British medieval library catalogues, such as no. 1, The Friars Libraries, or no. 5, Dover Priory. That would require more visits to the NLS and time spent on research, which I can’t really do right now. The interesting thing is if anyone knows of specific evidence for personal private books? Such as in wills, e.g. the necromancer’s I blogged about back in July. Alchemy and Magic, are they related? The answer is of course, yes and no. Which is of first year undergraduate level frankly, nothing more than a re-hashing of a bunch of textbooks, or of tertiary works i.e. those which cite the works which cite the original sources. Nevertheless, the question is always a good one to discuss. You’ll notice that the essay references lots of works that concentrate on Magic, not so much on alchemy. * This is always a bit of a problem, with alchemy being ignored or lumped into other topics or viewed from a specific, often narrow and wrong, viewpoint. A glance through the book “Promethean Ambitions” by William R. Newman, who on pages 177-178 reckons that natural magic and alchemy in the Arabic period overlapped but were distinct. He then goes on to discuss the “Book of the Cow”, a book of Arabic magic which is rather enthusiastic for lots of disgusting processes in order to get the result that you want. Don’t say I’m not good to you – I looked up Singer with regards to this MS. It is a complex MS and Singer wrote a very complex network of references to all the alchemical MS she could find in England. Just learning your way about her work is a job in itself, in a way she was trying to make a hyperlinked document long before they were even thought of. Certainly it would be nice to have a modern equivalent, but transcribing and hyperlinking them all together is very far down the list of things to get done, even with all the unemployed people we have. The blys of hevyn god bryng hus to. The number of entries for Harley 2407 takes up nearly a page on pages 1040 to 1041 of volume 3, so I can’t exactly check them all. 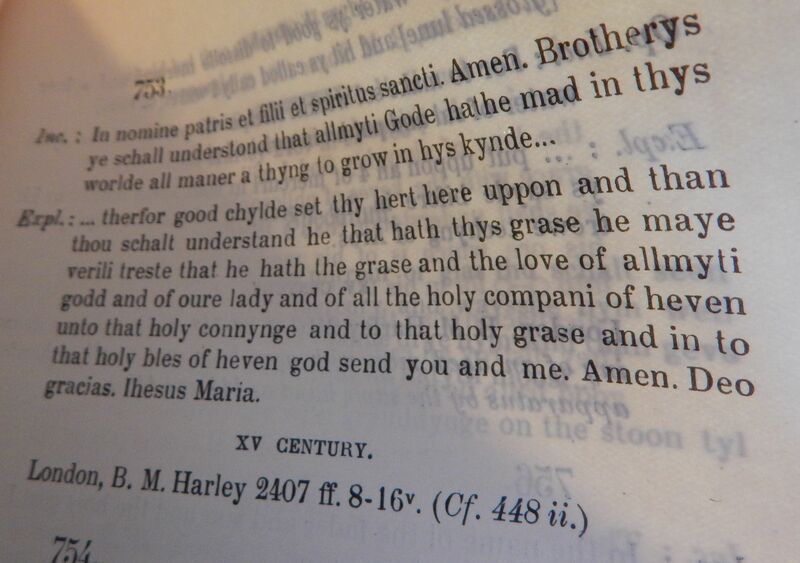 explct: … as well for mannes body as for metalle. In a previous post I mentioned the drawings, including the one on F107, which is part of f106-111v, which Singer says is late 15th or 16th century, probably by the same hand as other parts which she refers to. 56 operations, each figure to end of F110 has an English legend, and “The legends of the figures at first follow more or less the order of the table of operations on F106. They gradually diverge from the Table and on Ff110-111v there are no legends. The slight problem is that the pages are not cut! This leads to a dilemma. Do I cut the pages for maximum readbility, or do I keep them whole on the grounds that these appear to be first proof editions that have not been properly read or looked after? Anyway, here are some photos of relevant pages, including more information on the allegorical figures. I could look some others up if you like. Is this an unusual and often overlooked piece of alchemical equipment? When looking through alchemical works and examining the illustrations, it always pays to ask, is that real equipment and methods I see in use, or are they just making it up? So ever since I realised there was something odd smack in the middle of one of the illustrations from Thomas Norton’s Ordinal, I have been looking out for more evidence for it, or not. The first part of antiquarian studies consists of working out the date and provenance of manuscripts. In this case it was owned by John Dee and looked at by Elias Ashmole, as well as modern people like Dorothea Waley Singer who made a modern catalogue of alchemical manuscripts. Once that is done it might be decades before anyone takes it in hand and examines it properly. I have held and looked at this MS myself in the British Library; when I am feeling a bit uninspired it really perks me up to look at the original source of information, previously held by such famous people as Dee and Ashmole. Yes, you too can get to hold something read and thought over by such famous people!